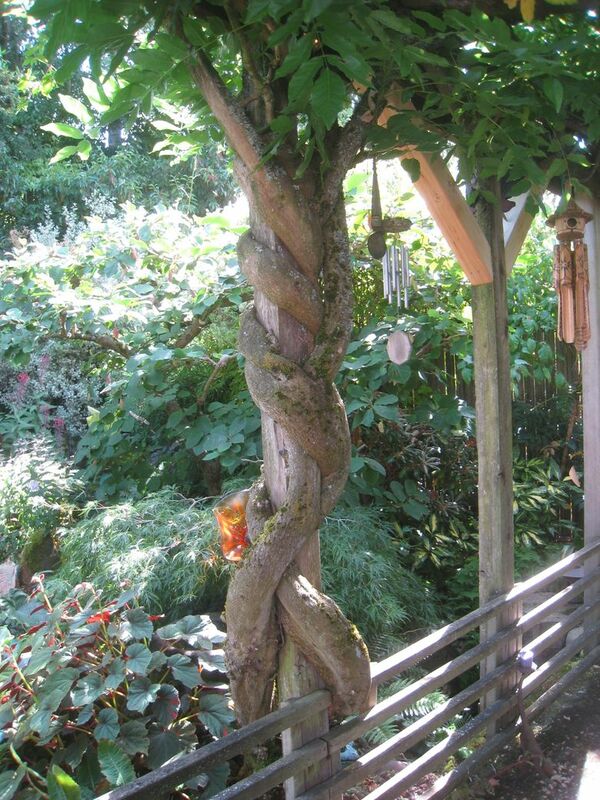 The key to growing a beautiful Wisteria is to train it to twist in its natural direction, then constantly prune it to keep it from becoming a monster. I HAVE A love-hate relationship with my wisteria. In May, when it’s in full bloom with long, hanging, fragrant flowers, I definitely love the tweedle out of it. It’s growing on a trellis over our large patio. Visitors to our garden go absolutely gaga when they see it flowering away in spring, with almost 1,000 blossoms hanging from the vines. The hate part is due to all the work it takes to keep this behemoth from ripping the roof off my house, and those of several of my nearest neighbors. The tendrils can grow 25 feet in one season, and they have an affinity for snaking under and ripping off shingles and rain gutters. Don’t even think about planting wisteria unless you enjoy working your hinder off, especially if (as I did) you plant it near a house, garage, tree or anywhere it can find its way in to cause trouble. Having said all of this, I would not trade my wisteria for anything. No other vine can match the beauty and fragrance of the flowers, and the gnarled vines wrapped around the arbor pillars look magnificent in winter. 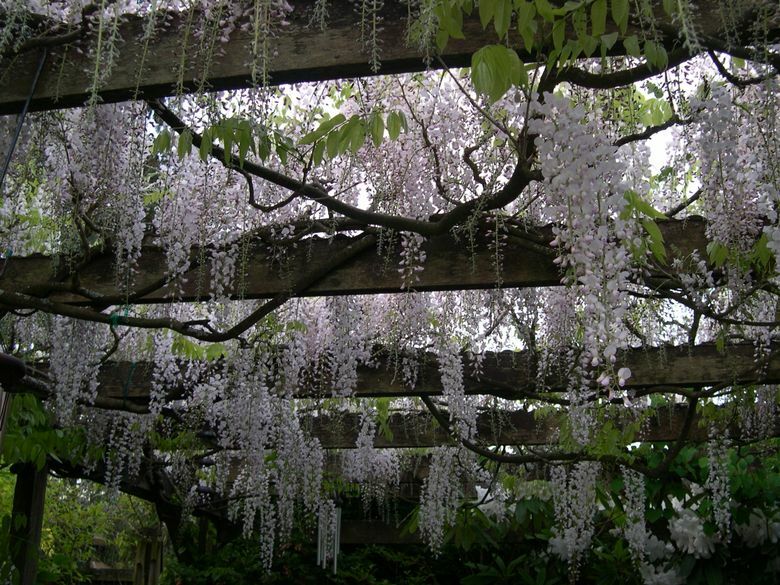 There are two species of wisteria typically available at local nurseries. 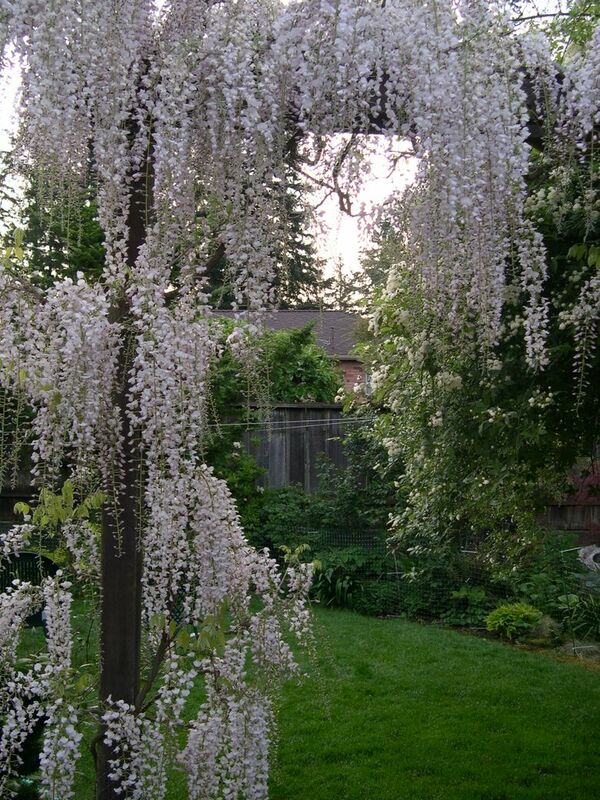 Wisteria sinensis is the Chinese wisteria. The showy, footlong flowers open all at once before the leaves emerge, putting on quite a show. 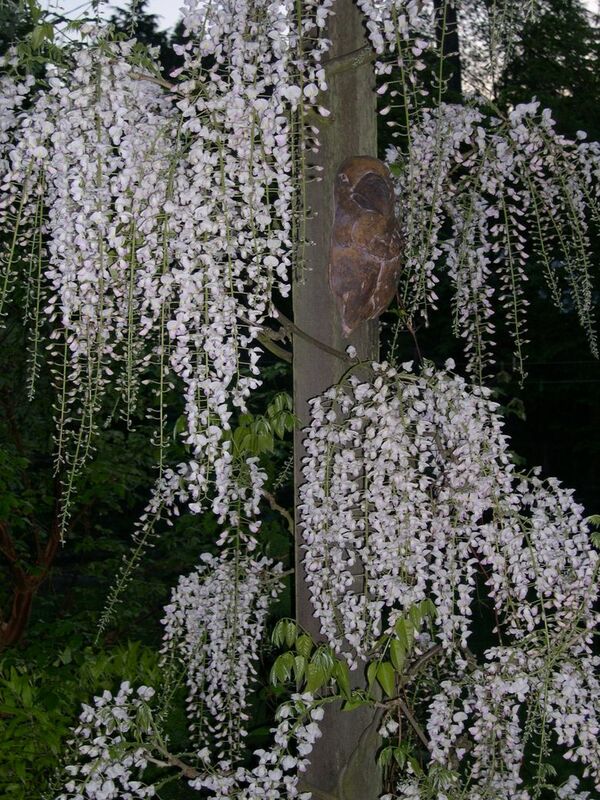 My personal favorite is Wisteria floribunda, or Japanese wisteria, because the blossoms (racemes) are so long (the record-holder is almost 6 feet). The key to growing a beautiful wisteria is to train it to twist in its natural direction, then constantly prune it to keep it from becoming a “kudzudian” monster. Right after planting, remove all but three vigorous stems, and twist them around the support that the vines will climb. These vines will form the framework, and must be tied in to hold them in place as they climb. Be ruthless at removing all other growth. Never fight Mother Nature by trying to force the vines to twist in a direction other than the one that they naturally grow. The vines will revert to their natural direction, and they will uproot the trellis and tie you to it! Cut the top of the vines as soon as they reach the top of the trellis. That will promote the development of strong laterals. Again, be ruthless: Allow no more than three lateral vines to grow on each horizontal support. Twist the laterals around the beams, and then tie them in. Wisterias normally bloom in early May. Soon after the blooming period is over, tendrils begin to grow out of the main structural vines that you’ve tied to the cross braces. For the first few years, while the wisteria is being trained, it won’t bloom because it is too young. Even so, the tendrils will begin to grow rapidly right after the normal blooming period is over. The trick to instigate flowering is to cut back these rapidly growing tendrils to about 6 inches long. This is called spur pruning. All the energy that would have gone into the 25-foot tendril is captured in the 6-inch spur, which stimulates flower bud production. Pruning in this manner usually results in flowering within four to five years after planting. Of course, this laborious task must be performed every spring, and two or three follow-up trimmings per season are needed to cut back later emerging tendrils. After reading this, unless you want to work hard on it the rest of your life, you might want to consider planting well-behaved clematis instead.